No Complaining? Sign Me Up! I need this sign some days. Daniel Decker’s blog post about no complaining in the office has me thinking about how much I complain and how much I hear various people complain. Of course this is not limited to the office. It’s at home, while out running errands, while visiting others, everywhere. What makes it worse is when the complaining is partnered with either the whiny voice, the martyr voice, or the self-righteous voice. All of which are equally bad, but the whiny voice drives me up the wall (just ask my daughters!). Why do people complain? Maybe because they want to tell someone about how they were wronged (or how they wronged someone else); maybe because something is not quite right in their life; maybe they just want to talk to someone and complaining is the only way they know to get someone to listen. The problem is that complaining for the sake of complaining is just not productive. How many hours do you lose over the course of a month listening to a co-worker complain about something that you could either do nothing about, or something that if they would actually do their job there wouldn’t be an issue? Or better yet, if they would use the time to fix the problem that they spent complaining, the problem would be gone? Time spent complaining is less time that you have to work, less time you have with your family, less time you have doing the things that mean something to you. Of course the reverse is true. 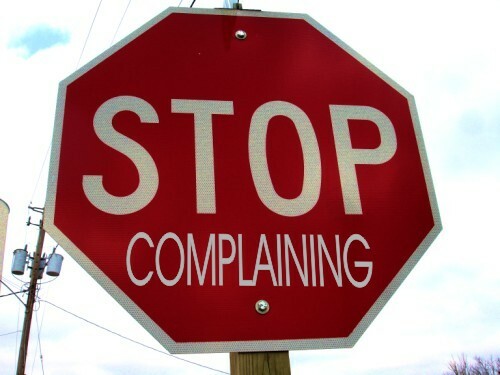 The time you spend complaining keeps you from fixing the problem as well and being a productive employee. I know you can’t police everyone’s speech. It’s not fair and it’s not right. However, you can monitor your own. This isn’t to say you have to be Miss Mary Sunshine all the time, but at least think about what is coming out of your mouth. Think about the time you are spending complaining. Think about how you may be keeping others from doing something they want/need to do. Does your office need a no complaining rule? Maybe, if the complaining is out of control and it has manage to infect every area of your business. But I think it can be dealt with on a person by person basis if people would just be more conscious of what they are doing. I am going to try and do my part by watching how much I complain. Thoughts? How can you reduce the amount of complaining you do or that others do to you? This entry was posted in Change, Culture, Leadership and tagged Business, change, Choice, Communication, job, Management by jenpeterson. Bookmark the permalink.